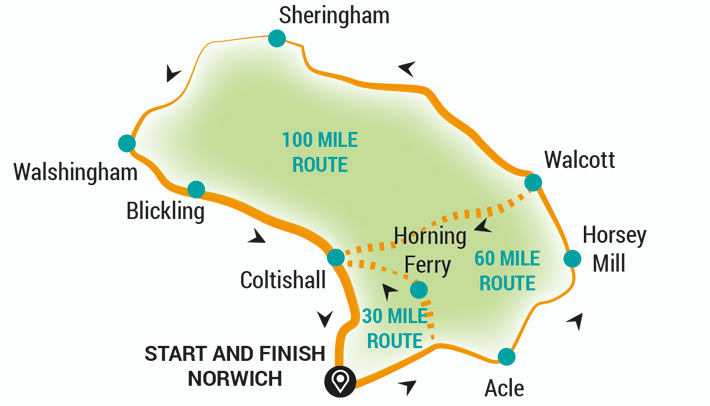 The 1st 100 mile ride in Norfolk celebrates it's 25th year with a new route! (in fact it's 103 miles this year!) Starting from City Hall and taking in the edge of the Broads, Horsey Mill, the coast (and some hills!) all the way out to Cley, then back past Blickling Hall before a triumphant return within sight of the Cathedral. Music, beer tent and food at the Finish, and signed routes, cycle mechanics, pick-up vehicles, medics and refreshment stops around the beautiful Norfolk countryside. Road/hybrid bikes recommended on 100 mile route. Click here to see a review of the 2013 ride in The Telegraph! Click here to see it voted no. 1 in The Independent's 10 Best Cycling Events for 2012! 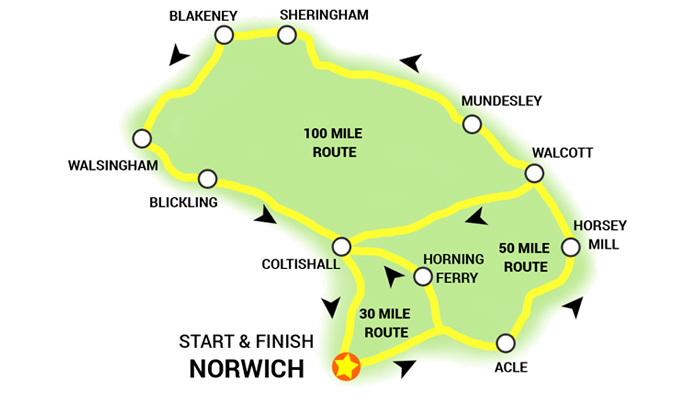 Click here to read a BBC report on the Norwich 100 event! "Looking forward to it, my 3rd time if you haven't been on it before it's a lovely ride and the big surprise for all those who don't know the area are the hills !" M. N.
ELEVATION INFO (TOTAL CLIMB): 3575ft. 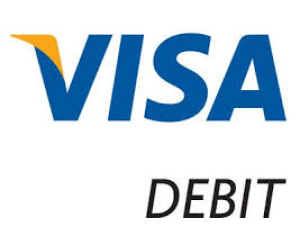 7.00am - 8.00am - individual start times printed on Entry Pack envelope (if you need to change your Start time just come along to the Bike Events tent in advance and we'll hand you a new time card). Minimum rider age 16 years. All riders under 16 MUST be accompanied by an adult over 18yrs and wear a helmet. Road bike recommended / hybrid or mountain bike suitable with narrow tyres. Parking: Chapelfield (Chapel Field Road, NR2 1RU) - once parked, wheel your bike into the lifts, go up to UG level and then walk out; bikes are not allowed on vehicle ramp or in The Mall. Smaller car park at The Forum (access via Bethel Street, NR2 1TF). Both car parks open from 6.30am for the event - these are closest to the start, but not necessarily the cheapest. For further parking info please visit Parkopedia. Please be aware of height restrictions on all these car parks! For 'welcoming parties': Please note there is no parking at the Finish itself. Closest (but quite small) car park is near the Adam and Eve pub (NR3 1RZ). Nearest station Norwich 1 mile from the start. Please check with operator regarding carriage of bikes. Home-Start Norfolk supports families with young children to enable parents to give their children the best possible start in life.